How AI in Video Games is furthering our knowledge of programming AIs in general. As my final Digital Humanities assignment of this semester, I was tasked to analyse any publicly available text using some visualization tools such as Voyant 2.0. I chose to analyse Artemis Fowl (2001, E.Colfer) in this way as it was the first book I read as child and nostalgia drew me back to it. There will be spoilers to the plot of this book beyond this point! Consider yourself warned should you wish to delve further. So, just what does this jumble of text tell us? At first glimpse it looks pretty meaningless, like a kid just scribbled all over his parents’ walls. However, we can see all the main (and even most of the side characters) names appear in this block of words. -Artemis Fowl (His name appears 748 times in total): Our protagonist, the boy genius who kidnaps our second main character, Holly and holds her at ransom. -Captain Holly (Her name appears 429 times): A fairy and captain to the armies of fairies who live just below our feet. -Commander Julius Root (His name appears 269 times): Commander of the fairy armies, his mission is to save Holly from Artemis. -Butler (His name appears 229 times): Artemis’ most loyal and deadly servant, military-trained man but with a soft side for his younger sister. -Foaly (184 appearances): A centaur who is an expert in all things computing, he is allied with Commander Root. -Mulch (149 appearances): A convicted criminal Dwarf with a nack for burrowing into places no one else can get to. He is reluctantly recruited by Root when it looks like he may be Holly’s only hope of escape. -Juliet (84 appearances): Butler’s sister who he cares about above all else, even Artemis. Other words being used such as “Fairy”, “Troll” and even “Human” to an extent in context show us a little of the world in which Artemis Fowl resides. It is a fantasy world where ages ago, humans evolved and pushed fairies (who were weaker bodied but technologically superior) under the Earth, where they stayed and were forgotten about except in myths. Artemis believed in these myths and lures Holly – which is where the story begins, however it shows that in the ancient past of this world humans and other mythical creatures were at war, setting up a resentment of one another bringing racism into the novel as a theme (which is developed on in further installments of the series). It also allows Colfer to write about fantastical creatures such as Dwarves with the power to burrow miles into the Earth, Trolls – mindless but powerful and dangerous creatures which dwell beneath our feet and so much more which gives this series a real flavour of that “fantastical but almost believeable world” one can truly immerse themselves in. So, in answering, Voyant allows us to quickly glimpse and assemble the image of an entire book, it’s characters, main themes, genre and even the frequency of characters appearing in one amazing tool. It is a fantastic way to covert raw data into visual text and particularly great at turning novels and texts into one “bite-sized” chunk. Our project was to contribute to Open Street Maps by either responding to an Humanitarian needed cartography initiative or mapping our local neighborhood on Open Street Maps (OSM for short). I chose to participate in initiative #1623 which included mapping Fiji (the island of Vanua Levu from the city of Lekutu to Naduri) as the Island had recently been hit by one of the most powerful storms recorded to date in the Southern Hemisphere. We were tasked with mapping three “blocks” or sections of the map, this included hand drawing roads, buildings and farmland in the affected areas the storm affect Fiji. We were also tasked with reviewing the work of another member of the OSM community and validating there work as correct. This was the first time I ever attempted to use software such as this and of course, I started off pretty confused. I stumbled into locking myself to Task #300 and edited this area using Bing Maps and ID Editor. I noticed someone more experienced had already filled out a secondary road on this area, which was a boon to someone as inexperienced as I. Knowing this could affect people in that area, I wanted to map this as precisely as I could, so I spent well over an hour mapping ever dirt road, building, farmland and one lake no one else had marked on a nearby adjacent block. Feeling that I had confidently filled out this block, I saved it and marked it as complete. I may also mention that upon starting this the map was 70% complete and had two more experienced members of the community working on nearby blocks with me, this gave me much more confidence in the case of an error being made (by an inexperienced member such as myself) it would be corrected. Gaining confidence on the software, I decided to validate Task#350 which was submitted by another member of the OSM community. After reviewing their work I noticed they had omitted several roads and had forgone mapping buildings and farmlands completely. I personally edited as many omissions as I could find, when I believed to be finished I validated the work as complete. However, within an hour I received a message from another member of the OSM community. This message stated that they had noticed I was a new account so they checked my validation and noted I had also omitted a road. They added this in and allowed me a second chance to validate Task#350 again. My second validation was accepted as correct. However, this experience really showed me the community of OSM, they are extremely diligent and keen to fix mistakes as soon as possible. If not, my mistake and omission of that road could have been critical in an emergency service making it to a site in time and not. I was surprised for the level of scrutiny the community shows the mapping but also very thankful for it as it is only after many iterations that a map is charted to complete accuracy. After spending some time looking for interesting tools on the DiRT (Digital Research Tools) directory, I stumbled upon one particularly interesting historical research site. Being an archaeology student, I was drawn to ORBIS, a geospatial network model of the ancient Roman World at the height of its power. (Roughly 200 AD) ORBIS reconstructs the time cost and financial expense associated with a wide range of different types of travel in the Roman Empire. Developed by Digital Humanities Grant of Stanford University and Center for Textual and Spatial Analysis (CESTA), ORBIS is essentially, a website that gives the feel of a Google Maps for an ancient Roman Empire, however it goes into extreme depth and details on Roman Life. For example, we can explore how a merchant would travel from Roma to Corinthus in the Summer by oxcart and see the routes he would take and expenses that would need to be accounted for. (If you’re curious, it takes roughly nine and a half days and you’ll be taking a detour in Messana.) Finally, we can see that this route would cost you roughly ~252 denarii (ancient Roman Currency), with 250 of the denarii being spent on sea travel. While ORBIS is a pretty niche site, it is stunningly detailed and could be used as a tool to study questions in various fields of study about antiquity, including trade and social interaction in the past. Below is an image of the rivers and roads that have been modeled into ORBIS. ORBIS is a free close-sourced webpage that anyone can access. While it deals with a niche subject matter, anyone can find an interest in discovering forgotten information of the Roman Empire, such as the cost of transporting a kilogram of wheat or a legion of soldiers across the Empire. With ORBIS, it is possible to create your own roman routes and discover the price of transport as a merchant living in the past. ORBIS contains 632 sites of the Roman Empire and covers close to 10 million square kilometres detailing the maritime and terrestrial travel. It even accounts for the monthly wind conditions and strong currents / wave height in increasing or decreasing the cost of travel by sea. In calculating any route in ORBIS you are presented with three options, “Fastest”, “Cheapest” and “Shortest” routes. The fastest route will always take the least amount of days to go from point A to point B, however it will not take into account the cost factor of sea travel or land travel so will often end up well over the amount of denarii any reasonable business man would ever spend! The cheapest route option will, as expected, calculate the least expensive route. This route is often much longer than the fastest route, however you’ll have denarii to spare after traveling by these routes! In study, the cheapest routes are often taken by merchants selling grain and can be used to see social interaction of Roman people as they traveled and who they may interact with along the journey. Finally, the shortest route will calculate the geographically closet route. However, many of the roads or sea-ways were less used and this often results in a journey that is both longer and more expensive that would have been expected. The goal of ORBIS was initially to model an ancient Roman World and contextualize the information of routes that had long since been forgotten in a modern way. This data is now digitized and preserved forever in an interactive medium. It can also be used to analysis the networks of travel and routes in Roman times and can be used to analysis the spatial distant between Roman sites. To this, I will say ORBIS has achieved its goals, not only does it bring us a modern overview on the topic of Roman socialization and life expenses but it allows us to in a way travel back in time and plan our own routes across the world. ORBIS is not a simple website to use at first. However they do offer tutorials in the about tab in the top right of the screen which allowed me as a beginner to understand the procedures in making my own routes within 20 minutes. One small technical problem some may encounter is that this website is designed with Chrome and Safari in mind, so accessing it with Internet Explorer or other web browsers may leave users with unsatisfactory results. However, there is another version of ORBIS (which they link you to immediately when accessing the website) for those browsers. ORBIS is an amazing example of how we can digitized information that is otherwise long forgotten into an interactive website. Some may ponder as to what advantage digitization of the past in such a manner is important in our world. Well, simply put, ORBIS makes finding the records of these routes a simple process rather than the alternative of looking through ancient ledgers to find the same information. In a way, ORBIS even feels like a game where you are managing the routes people travel in ancient Rome, and that makes it not only a useful resource but in a way, fun aswell. Until next time, this stream is going offline, thank you all for reading! It seems our module has really taken a shining to this topic. From Andrew Wiggins’ post (which I believe to be the first on this, correct me if I’m wrong) to the most recent presentations with Bohemian Rhapsody by Queen being converted to Emoji by a member of my course. It’s pretty apparent this topic really brought some emotes to our group 😉 . While it’s pretty much old news by this stage and no longer a hot topic of debate, I thought I’d close this blog (well, the necessary posts for this semester) out with the topic that so many of us started off with. Then this type of kaomoji developed into a western style. This is when kaomoji is replicated on western keyboards. (<(o_o<)) Though, not many kaomoji are imitable. Beyond Kaomoji from Japan, Korea also have a variant to our standard emojis by using Korean Hangul letters. They’re called Jamo emojis as jamo is the korean word for letter. An example is : ㅠㅠ which represents a crying face. Eventually the styles of emoji and then there imitations lead to the creation of 2channel style emojis. Essentially, the internet as a culture created their own variant of emojis.Originally appearing on the internet forum board 4chan it combined many different languages (such as Kannada) to create an even greater variety of emoji to be used. An example of a 2channel style emoji would be : ಠ_ಠ which is supposed to appear as a disapproving look. To me, seeing the vast variety and cultural differences of emoji from around the globe really makes me believe emojis are a new way in which we express ourselves. I don’t believe it possibly to see quite so many variations and nuances from culture to culture if they were not important to us as individual beings. Personally, I like to try replicate kaomoji with my western keyboard. I do this I believe because I’m showing both that I have an interest in the Japanese culture while also noting I’m from a western society. Perhaps I’m looking at this too philosophically but I do honestly believe there is a tie in with culture, our own personal passions and the emoji. What do you believe? Does it have something to do with cultures wanting to express themselves through 1 or 2 bit expressions? Leave a comment to discuss! Until next time, this stream is going offline and in case I do not write again until after the holidays, Merry Christmas everyone! And what did I have to say on the topic? Well I said “I believe openness on the internet should be sharing info with each other with knowledge accessible to all people everywhere” (a) well of course, this was my uninformed mind talking here, with more digging I discovered that openness is a concept characterized by putting weight on transparency and freedom, unrestricted access to knowledge and information, especially in this day and age on the internet as well as collaborative or cooperative management and decision-making rather than a central authority. As a Digital Humanities student, I believe openness on the internet encompasses many of our goals. Between Moravec’s (digital humanity activist) acclaimed writing in public project and Swartz’s (a pioneer of open internet access and recognized as a martyr to some) development of creative commons as an attempt to open the knowledge of the internet up to the public, it is obvious to see technological developments have changed the way we learn. Despite these attempts however, still the collective works of the human race are stored on the internet with only a select few currently able to access them. From Patrick O’Toole’s Twessay (c) “Transparency of data is the key to empowering governments & citizens on a global scale” to this, I discovered that the publishers, like Elsevier are making up to a $1.1 billion profit (2012) and are exploiting the original writers. How are they doing this? Well in the words of Samuel Gershman  “When I published these papers in Elsevier journals, I was required to hand over the copyrights”. Not only does this bar knowledge behind paywalls only universities or other huge institutions have a chance to afford buying information from, the original writers never see a penny of the profit. Also from Arlene Murray’s Twessay (b) “Pay walling pioneering research is immoral” and I honestly could not agree with her more. So, with all this working against openness in our modern era, what can we do to tear down these “pay-walls” ? Well, Swartz made a huge attempt when he created Creative Commons, a way of easily sharing copyrighted work. While this greatly helps modern works, it does not help us with all the knowledge already hidden beneath restrictions. Swartz, as some type of last stand against this moral injustice worth a guerrilla manifesto  urging people to share any information they could. He states how piracy in this regard is not really immoral, in face it’s a moral imperative. Only those blinded by greed would refuse to let the human race have access to our collaborative knowledge base. From Andrew Wiggins’ Twessay (d) “Openness to me is the idea of unrestricted access to knowledge and no one body in charge of it,more of a cooperative structure” – So does openness actually exist in today’s world or is it just a hopeful ideal long dead because of corporate greed? Well, if one was to give just a cursory glance, then no, openness on the internet is long dead and the corrupt corporations stand victorious. 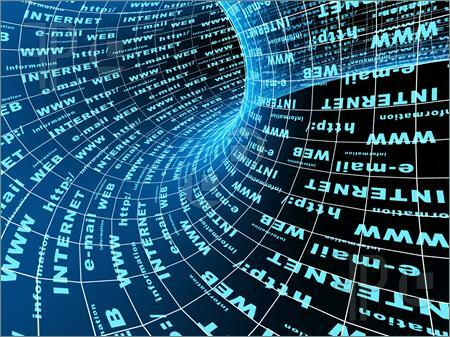 However, if one were to really search deep and uncover the “underground” revolution online, we would see it is possible to find academic sources on the web. I’m not even sure if I should mention it here on my blog for fear of the sites being taken down but http://gen.lib.rus.ec/ and http://www.academictorrents.com/ have made well over 12.27 Terabytes of academic data available to the public eye. So to all readers of this post, know that there is a mutiny taking place, we will one day soon overthrow the tyrannical likes of Elsevier and Jstor. I believe I’ve said all I can on this topic, together we will need to work together to achieve true openness on the internet, so work hard my friends! Until next time, this stream is going offline. While there was the concept of “Fair Use” on the internet for copyright law was created to allow things such as commentary, parody, news reporting, research and education about copyrighted works without the permission of the author. Basically, In reproducing an article, it would only be deemed fair usage if you were to use it to criticize or highlight the quality of said article. If it was used because you couldn’t find time to write your own story, or didn’t want your readers to have to register at a web site it would most likely not be deemed fair use. 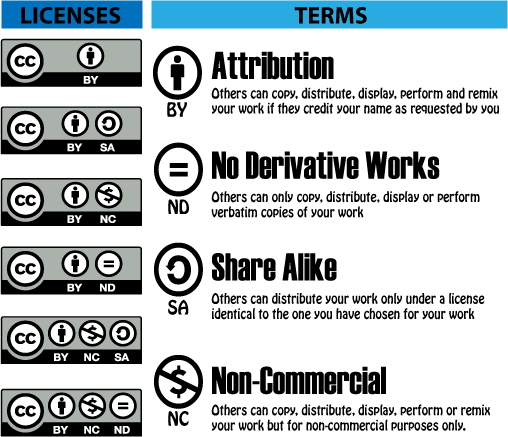 The (cc) (Creative Commons) logo in contrast to copyright allows a publisher to options on how there content is used. There are six contracts (as seen in the image above) which allow a publisher to control the access the public has to their content. Not only does Creative Commons allow more control for the publisher, usually it gives more access to the reviewer, researcher, etc. who are using the publisher’s work. It refines your copyright and streamlines how you give permission. -Share Alike : New creations that use the original source must follow the same license as the original. It’s evident to see that Creative Commons allows more diverse control for the publisher and is shown to increase sales (as the work can be used by the buyer) if the original source is to be monetized. Remember, Creative Commons is actually a license that is applied to a work that is protected by copyright. It’s not separate from copyright, but instead is a way of easily sharing copyrighted work. Creative Commons allows us to use works on the internet even through copyright protection. So remember, next time you’re using a source to check it’s creative commons license and if your using it correctly. I believe this sums up the majority of what I needed to say on the concept of creative commons and how it improves on current copyright laws. My next post should be Thursday, on the topic of Openness, which will combined elements from our classes’ recent Twessay. Until then, This stream is going offline. Exploring the developing concept of digital humanities.